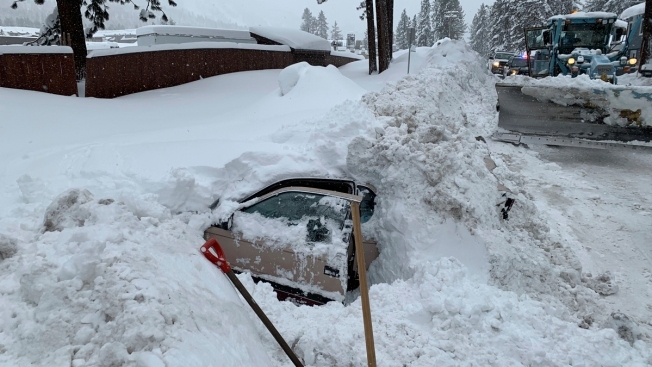 This Feb. 17, 2019 photo provided by City of South Lake Tahoe shows a car buried in snow in South Lake Tahoe, Calif. Authorities say a snowplow operator inadvertently bumped into a car buried in snow and found a woman unharmed inside. Chris Fiore, spokesman for the city of South Lake Tahoe, highlighted the Feb. 17 incident in a Tuesday, Feb. 26 news release in order to urge safety precautions in winter weather. A woman who authorities believe was living in her car was rescued after a snowplow inadvertently bumped into her vehicle, which was buried in snow. Fiore said the snowplow driver bumped into the back of the car, which popped the vehicle's trunk open. After that happened, workers from the plow truck started shoveling around the vehicle to prepare to tow it when the woman put her hand on the window from the inside.